Happy weekend. The markets may be closed, but wise investors are getting a jump on things. Here are three must-see stories (and one chart) that will put you ahead of the pack. This earnings season could be … interesting. S&P 500 companies on average are estimated to turn in 14.5% growth in fourth-quarter profit. Yet at the same time, 72 S&P 500 companies have issued earnings warnings, twice as many as have issued positive guidance, according to FactSet. What’s more, analysts are now looking for single-digit earnings growth for the next three quarters of this year. Part of the problem is tough comparisons. 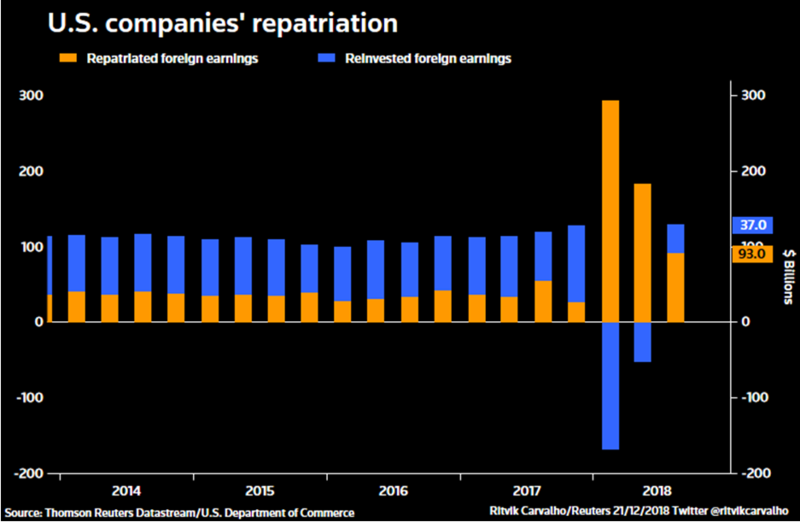 U.S. companies repatriated over a half-trillion dollars in 2018. Now add in the earnings boost from tax cuts, and 2018 was a stellar year. Will this weigh on the market going forward? Stick around and see. U.S. oil prices moved higher for nine sessions in a row. (Friday ended that streak.) That’s a great run — the best bullish move in oil in nine years, enough to lift oil out of the bear market it plunged into recently. Could it continue? Yes, if OPEC can get its act together and follow through on its recent 63,000-barrel-per-day production cut. 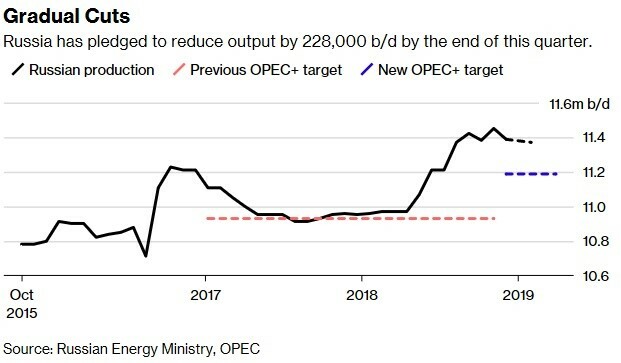 OPEC and its allies have agreed to trim output by a total 1.2 million barrels a day in the first half of 2019. And more bullish news: oil producer and OPEC cooperator Russia seems to be making ITS cuts. The move higher in oil has been powered by three things: A 63,000-bpd output drop from OPEC, a decline in last week’s U.S. crude oil inventories, and optimism over U.S.-China trade talks. On the downside, there still haven’t been any solid developments in the trade talks, and that may be more hope than proof. Plus, oil inventories go up and down. But this is a trend worth watching. About one-fourth of the federal government is closed for business, and won’t reopen until Republicans and Democrats work it out. Every week that the budget shutdown drags on, it shaves between about 0.04% and 0.07% off of economic growth. So far, that’s about $1 billion per week. That’s not too much of a hit in a $19 billion economy. However, 800,000 federal workers are going without paychecks, and that pain could snowball. By Friday, the shutdown cost the economy $3.6 billion. Within two weeks, S&P says, the losses from the shutdown will be larger than the cost of the wall itself. And there is also the potential for much larger damage done to U.S. consumer and business confidence. In fact, it’s looking like Civil War in Washington … and my team and I will tell you the impact it will have on stocks, bonds, gold, oil and the dollar in a special “Supercycle Market Update.” This video conference is slated for 2 p.m. Eastern on Tuesday, Jan. 15, and you can sign up for it with just one click. That’s it for this week. Have a great weekend, and we’ll talk to you next week.